Weather forecasts are working against my crave for summer: apparently this weekend won’t be blessed by sun, cold drinks and an afternoon nap in the shade of a leafy tree. Apparently it will rain. They say. Yesterday a sudden rainstorm nullified my effort to have crystal clear windows, temperatures dropped significantly and, as a reaction, I put a stew and some broth on the stove. It is raining outside, what’s better than baking a cake? A thick slice of ricotta cake will sooth the disappointment for a rainy weekend, will put a beaming smile on your face on any Sunday morning along the smell of just brewed coffee and will help you through next week, which I suppose will be demanding as the last one. This is exactly the feeling that I’m looking for in these first months of living together, the feeling of really living, of doing it up right: a cake on the counter during the week is a sign that I am succeeding. Simple pleasures for a modest happy life. After a few weeks, when Tommaso asked me for a simple cake for breakfast – please make me something simple, not too complicated, I just want to have a slice of cake with me coffee in the morning – I made it. It is a modest cake which you can make without effort: it takes two bowls and a wooden spoon or a whisk. 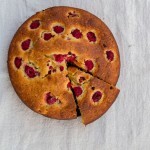 It is moist and fluffy, spiked with berries, the ideal start for the next morning, whether it will be quiet, accompanied by a book and a cup of tea, or on the run, with one foot already outside your house, drinking an espresso standing in your kitchen. It is so simple that Tommaso put together a video recipe while I making it: simple, irresistible, quick, you can see it. 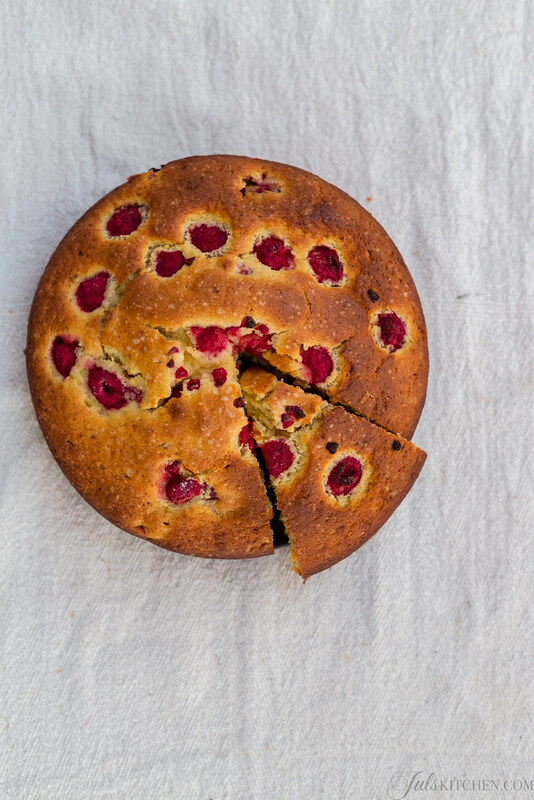 Even if it is not raining but there’s a wonderful sunny day waiting for you outside, bake this cake which will happily greet you every morning at breakfast time. In a medium bowl whisk the ricotta with the beaten eggs and the vanilla essence until smooth. In another bowl whisk all the dry ingredients: flour, cane sugar, baking powder and salt. Scrape the ricotta whisked with the beaten eggs into the dry ingredients bowl and fold until just until blended. Finally fold in the melted butter and 2/3 of the frozen raspberries, taking care not to crush them. Grease and flour a 22 cm round cake pan. 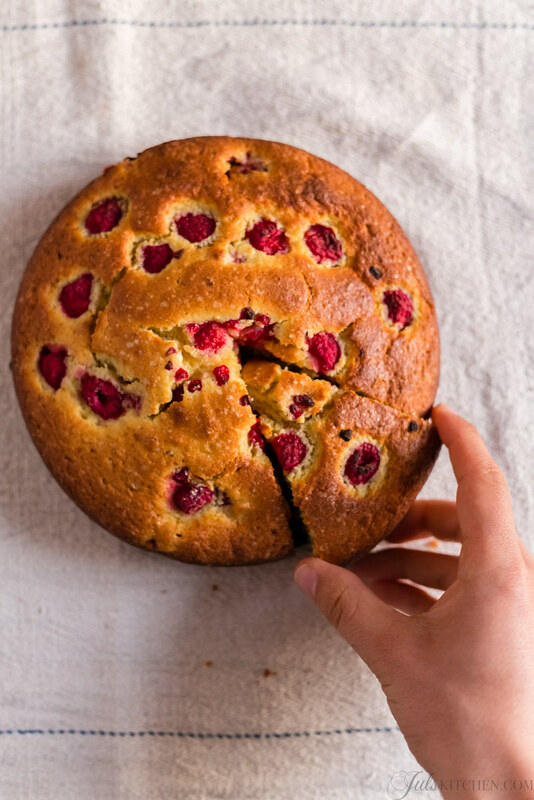 Scrape the batter into the prepared cake pan and scatter the remaining raspberries on top. Heat the oven to 180°C (350°F) and bake the cake for about 50-60 minutes until golden brown and a tester inserted into the centre comes out clean. Let cool down for at least 20 minutes before unmoulding. 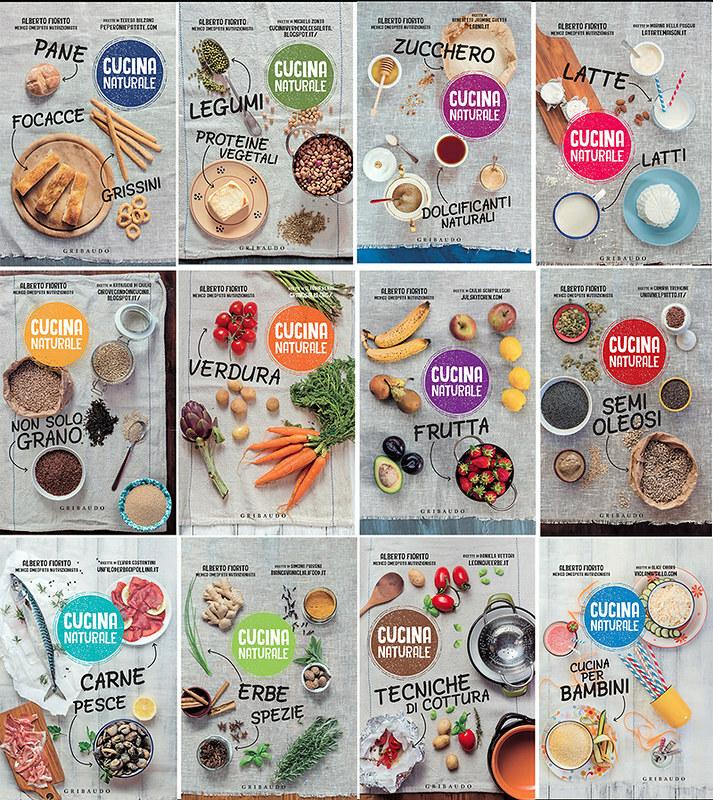 I am also proud and excited to share the new project which kept me in the kitchen in the last months: I took part to a new book series, Cucina Naturale, where twelve foodbloggers explored all the different aspects of cooking inspired by a natural approach: no preserved food, chemicals or preservatives but organic ingredients and healthy cooking methods. 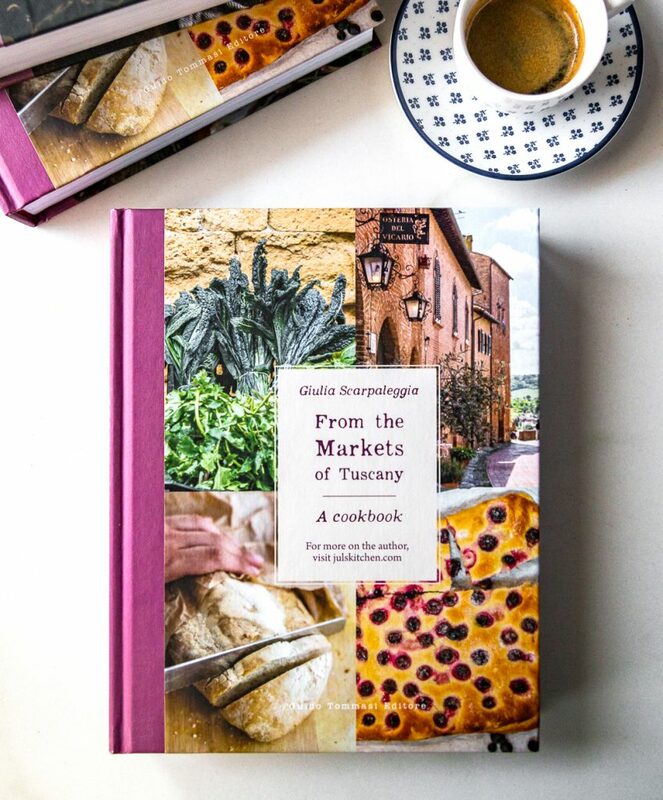 I shot all the covers for the book series and developed the recipes for the fruit cookbook: 40 sweet and savoury recipes from porridge to salads, soups, cakes and main dishes. It will be sold with a Tuscan newspaper, Tirreno, on the 16ht of June and with Arena, Il Giornale di Vicenza e Bresciaoggi on the 23rd of June. 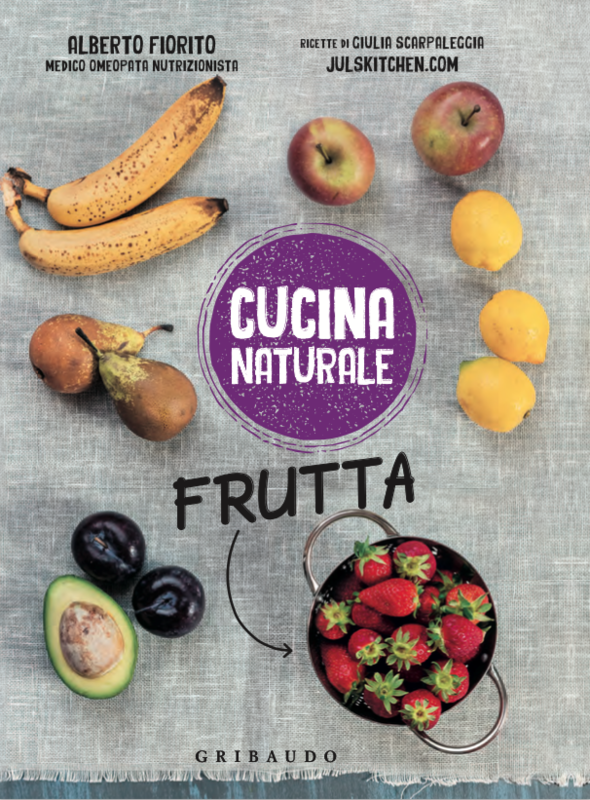 Unfortunately it will be just in Italian, but don’t despair, another project is simmering on the stove! Now I’ll show you how to make gnudi A new cake, a new look, a new book, a new video, one more year for me… Walking hand in hand. Ricotta and peach cake and the JK newsletter It’s my birthday: let’s celebrate! A delicious looking and sounding cake! Perfect with a good cup of tea and a book. Oh, believe me, I would love to have a slice, too! The cake looks delicious! But, the recipe calls for castor sugar and the instructions says to add brown sugar. What sugar is it? Thanks so much as I can’t wait to make the cake. it is cane sugar, I’ll correct it, thank you! I wish I’d had this recipe when I made my Triple Mushroom Ravioli post. You see, we had a huge container of ricotta left and we didn’t know what to do with it. This recipe would have been perfect. There is nothing like the smell of a cooking/baking kitchen. It seems so alive!! Grazie per la ricetta. I am looking forward to making it. Triple Mushroom Ravioli sounds like something I would adore! I usually make cakes with leftover ricotta, a pound cake often! Same weight of eggs (with the shell), sugar, flour and ricotta, then baking powder and spices, sometimes fruit, too! It’s the perfect end for leftover ricotta! This looks and sounds fabulous! I love ricotta based cakes. I’m looking forward to giving it a try this week myself! Please give it a try! You’ll love it, too! This looks great and is it possible when posting recipes to post with “cup” measurements? 🙂 Can’t wait to make this “torta”!! Mille Grazie..saluti da New Y ork! Ciao Antonette, check the link on Bon Appétit magazine, you’ll find the cup measurements. Mille Grazie!! I posted my wonderful result di questa torta on your FB page!! I’m wanting to make this fur my small children (I haven’t quite succumbed to the Italian sugar high breakfast for my kids yet! ); I’m guessing that the sugar can be replaced by honey, what do you think?